Dead. Dead as a door nail. Oh, not one of us. It wasn’t a person that was dead. It was…our gym membership. We signed up for a gym membership a while back. We paid for a full year…and barely went. We’re pretty health conscious individuals (at least we think so), and wanted to exercise more, but the business of life soon took priority over trips to the gym. One reason we didn’t use the gym membership as much is because we thought my wife’s Rheumatoid Arthritis would be a little better. After deciding that the gym membership wasn’t right for us, we were looking for an exercise that would be easy on the joints, but still provide a lot of benefit to the whole body. Busy as most of us are…I wanted something that would exercise the whole body rather than something that would require multiple workouts isolating different parts of the body. We started to turn our focus to a workout machine that we could use at home, but that would provide the most bang for our buck. Rebounders started to catch our eye. We did some research and found that Rebounding was a great way to exercise just about every cell in your body as the pressure of gravity is applied to the whole body (all the cells) on the down-bounce, and released to near weightlessness (at the pinnacle of the up-bounce). We heard that NASA used rebounding for the astronauts because it was one of the most efficient exercises out there. An important factor we were looking for was a device we could use at home, easily store, yet be able to bring out and use in just a couple minutes. The rebounder was looking good here too. The elliptical machines were just too Huge, and other workout machines didn’t seem to work the entire body as well. We felt that if we had it at home rather than at the gym, we’d be more likely to use it, and save the time, energy, and fuel it took to get to the gym. 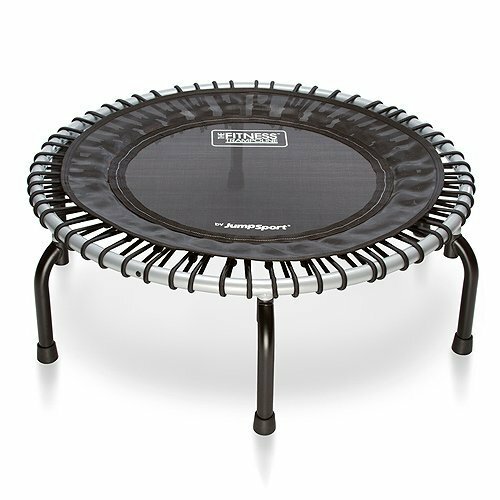 There are lots of types of rebounders, and we researched a lot…a whole lot on the type we wanted. There were some that were more than $800, and there were some that were $50. We quickly learned that a big selling point for us was the noise…or lack thereof in just two different brands that we found. The rebounders with springs were noisy. If we wanted to watch TV, listen to a podcast, or exercise while the kids slept, the metal spring based rebounders made annoying noises. The bungee corded rebounders were essentially silent compared to the harsh sounds coming from the metal spring rebounders. Injury was something that we definitely didn’t want from our rebounder. We heard horror stories of people using the cheap $50 rebounders and injuring themselves. The bungee rebounders, which were more expensive but looked softer on the joints appealed more to us than the metal spring rebounders, although there were plenty of high-quality metal spring rebounders. The bungee based rebounders would make it easy to walk or jog in place while watching TV and provided a soft enough bounce without pronating (turning the joints inward when bouncing). We could also adjust the tightness/strength of the cords in one model we were looking at: the JumpSport. Can we Stick to it? I’ll come back to that in a minute. But starting out, we wanted something that we’d keep using over and over so it didn’t find a place next to our gym membership. We narrowed our search down to two models, the Cellerciser and the JumpSport Mini-Trampoline. The Cellerciser had metallic springs, and the JumpSport had bungee cords. We weren’t 100% sure which one we wanted, but after reading a lot of reviews on Amazon, we decided to go with the JumpSport. For reference, I’ve included a couple videos about the Cellerciser and the JumpSport if you’re curious about how they sound and look. YouTube user roundlady shows us the JumpSport. She has many different rebounders and has picked the JumpSport as one of her favorites. She has lymphatic cancer and enjoys rebounding as a great form of exercise, and we’ve learned that rebounding helps clean out waste through the lymphatic system. Did we Get a Rebounder? What about Continued use? Yes, we got a rebounder, and we’re happy to report that we use it every week, multiple times per week. I use it almost every day, and my wife uses often. We found out she was pregnant just after we got it, so she doesn’t jump on the rebounder, but she’ll put on a movie and just walk in place. It’s been very helpful during the winter months. Can Rebounding Make You Feel Better? Can it make you feel better? Well, that’s up to you, but I’ll jot down how it’s made us feel better. A rebounder helps the body’s lymphatic system flow. The lymphatic system in your body is similar to your blood vessels. It’s all throughout your body and it collects cell waste that needs to be disposed of. There’s just one problem. Your blood vessels (the circulatory system), has a pump to keep things moving. Your body’s lymphatic system has no pump. Fluid moves through the system when you move. Specifically, up and down movement. Once we had our rebounder we could tell it really helps. As a side benefit, it really helps clear the sinuses. Since we live ever increasing sedentary lifestyles, we need this movement in our daily routine more than ever. Rebounding helps the lymphatic system to flow and get waste out. Imagine all that toxic waste from the cells just sitting in the tissues of your body…causing problems. Movement, especially that up and down movement from a rebounder helps get the cell waste out of the body through the lymphatic system. In our use however, we’ve noticed something interesting. If I have a little bit of sinus congestion, jumping on the rebounder helps clear it up! It moves it out of the sinus cavity so I can breathe more easily. I think it’s helped keep a couple colds I was exposed to and felt coming on at bay. In the winter months, I’ve usually felt congested, and if I had a cold, it seemed like weeks and weeks before it was gone, but not this winter. I could feel the effects of the cold begin to take place, but with rebounding and much healthier eating than I’ve had in the past, I’ve felt great in the winter! We had a friend who had her sinuses operated on due to sinus infection. I wish she would have told us beforehand, and we could have had her try the rebounder first before going the invasive surgery route! Of course with any workout or exercise routine, you need to make sure conditions are safe, consult your doctor, use common sense. Rebounding has provided a good workout, and when I have a good workout, I feel good. You can put as much or as little into the workout as you like. The more the better, but some have suggested to take it slow and easy to begin with, and I agree. You need to get used to it. I feel that my energy levels are better after having rebounded for a while, got the blood pumping, and movement in the body. Our choice came down to two rebounders. Ultimately, we got the JumpSport, and have loved it, but if you’re wondering about the other model that came in at a close second, it was the Cellerciser. You can get the Cellerciser at Amazon here. On Amazon, you’ll be able to see the reviews for the various rebounders which helped us out a lot in our decision. The JumpSport was less expensive than a lot of the crazy expensive rebounders, but we decided to add an extra (the support bar) which attaches to the rebounder for extra support. The bar is optional, and we haven’t used the support bar very much, but we’ve got it for when we need it.